Our cup dispensers are excellent for hygienic and space-saving storage of drink cups and mouth rinse cups in the dental practice. In an attractive design, easy filling and easy removal based on the first-in, first-out principal. 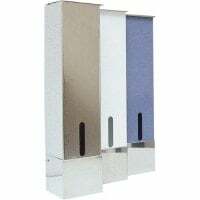 Cup dispensers are happily used in the dental practice, as they are both practical and hygienic. They are suited for hygienically storing up to 70 mouth rinse cups. Thanks to the practical wall bracket, cup dispensers can be mounted on the wall, on a shelf or even in a cabinet to provide space-saving storage. The attractive design not only makes it suited as a mouth rinse cup in treatment rooms, but also as a drink cup dispenser in waiting areas. Furthermore, this dispenser can be used to provide cups for post-toothbrushing rinsing e.g. in patient restrooms. Filling the cup dispenser is quite simple. After lifting the lid of the filling opening, the cups can be placed in from the top. On the underneath side of the dispenser, the mouth rinse cups can be individually, hygienically removed. This system is particularly suited for dental practices, since the cups are filled/removed based on the first-in, first-out principal. While stored in the cup dispenser, the rinse cups are protected from dust and contamination. 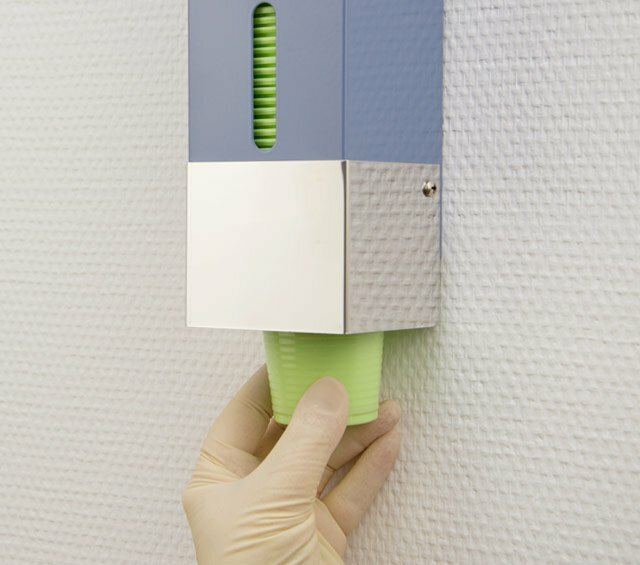 The high-quality material of the dispenser provides simple cleaning and disinfection.